"We can see a completely new component of the center of our galaxy with NuSTAR's images," said Kerstin Perez of Columbia University in New York, lead author of a new report on the findings in the journal Nature. "We can't definitively explain the X-ray signal yet — it's a mystery. More work needs to be done." 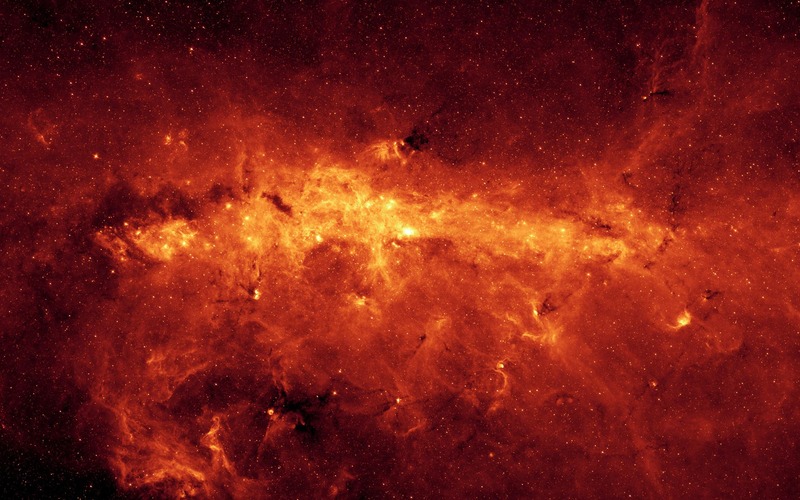 Peering into the heart of the Milky Way, NASA's Nuclear Spectroscopic Telescope Array (NuSTAR) has spotted a mysterious glow of high-energy X-rays that, according to scientists, could be the "howls" of dead stars as they feed on stellar companions. The center of our Milky Way galaxy is bustling with young and old stars, smaller black holes and other varieties of stellar corpses – all swarming around a supermassive black hole called Sagittarius A*. The image above reveals what cannot be seen in visible light: cooler stars (blue), heated dust (reddish hue), and Sgr A* supermassive black hole as bright white spot in the middle. NuSTAR, launched into space in 2012, is the first telescope capable of capturing crisp images of this frenzied region in high-energy X-rays. The new images show a region around the supermassive black hole about 40 light-years across. Astronomers were surprised by the pictures, which reveal an unexpected haze of high-energy X-rays dominating the usual stellar activity. 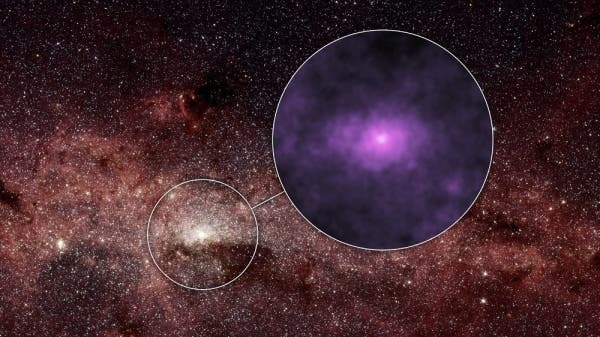 "Almost anything that can emit X-rays is in the galactic center," said Perez. "The area is crowded with low-energy X-ray sources, but their emission is very faint when you examine it at the energies that NuSTAR observes, so the new signal stands out." Astronomers have four potential theories to explain the baffling X-ray glow, three of which involve different classes of stellar corpses. When stars die, they don't always go quietly into the night. Unlike stars like our sun, collapsed dead stars that belong to stellar pairs, or binaries, can siphon matter from their companions. This zombie-like "feeding" process differs depending on the nature of the normal star, but the result may be an eruption of X-rays. According to one theory, a type of stellar zombie called a pulsar could be at work. Pulsars are the collapsed remains of stars that exploded in supernova blasts. They can spin extremely fast and send out intense beams of radiation. As the pulsars spin, the beams sweep across the sky, sometimes intercepting the Earth, like lighthouse beacons. "We may be witnessing the beacons of a hitherto hidden population of pulsars in the galactic center," said co-author Fiona Harrison of the California Institute of Technology (Caltech) in Pasadena, and principal investigator of NuSTAR. "This would mean there is something special about the environment in the very center of our galaxy." Other possible culprits include heavy-set stellar corpses called white dwarfs, which are the collapsed, burned-out remains of stars not massive enough to explode in supernovae. Our sun is such a star, and is destined to become a white dwarf in about five billion years. Because these white dwarfs are much denser than they were in their youth, they have stronger gravity and can produce higher-energy X-rays than normal. Another theory points to small black holes that slowly feed off their companion stars, radiating X-rays as material plummets down into their bottomless pits. Alternatively, the source of the high-energy X-rays might not be stellar corpses at all, astronomers say, but rather a diffuse haze of charged particles, called cosmic rays. The cosmic rays might originate from the supermassive black hole at the center of the galaxy as it devours material. When the cosmic rays interact with surrounding, dense gas, they emit X-rays. However, none of these theories match what is known from previous research, leaving the astronomers largely stumped. "This new result just reminds us that the galactic center is a bizarre place," said co-author Chuck Hailey of Columbia University. "In the same way people behave differently walking on the street instead of jammed on a crowded rush hour subway, stellar objects exhibit weird behavior when crammed in close quarters near the supermassive black hole." The team says more observations are planned. Until then, theorists will be busy exploring the above scenarios or coming up with new models to explain what could be giving off the puzzling high-energy X-ray glow. "Every time that we build small telescopes like NuSTAR, which improve our view of the cosmos in a particular wavelength band, we can expect surprises like this," said Paul Hertz, the astrophysics division director at NASA Headquarters in Washington. NuSTAR is a Small Explorer mission led by Caltech and managed by NASA's Jet Propulsion Laboratory in Pasadena, California, for NASA's Science Mission Directorate in Washington.